Wyoming . . . "As a retired educator, after 35 years in the classroom, I can appreciate the skill that Dora Hagge exhibits in her glowing color demonstrations and in her lectures . . . . . comprehensive, interesting, knowledgeable and professional. She is an inspiration to her students." Nebraska . . . "Dora presents design and color theory in such a way that the light bulbs immediately go on in your head and solutions to the problems you have been struggling with become a reality you can deal with." Maryland . . . "I found Dora's design workshop to be empowering! 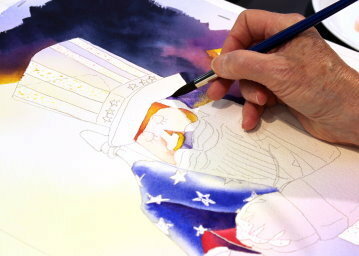 I now have the tools to control many aspects of watercolor that previously controlled me." Indiana . 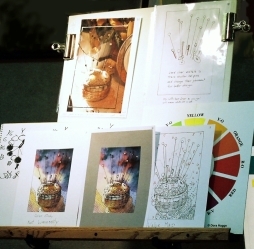 . . "I learned the importance of design and value sketching, color impact, and making a color key. I hope I can retain a fraction of what I have learned. Please do come back!" Colorado . . . "You always bring joy into our workshops. Thank you for sharing your knowledge, wisdom, and good humor. I think of you often, especially when painting, and smile. Thank you for illuminating my life and showing me how to dream in living color. I look forward to participating in future workshops with you. West Virginia . . . "I enjoyed your classes so very much . the best I've taken over the years. Keep teaching." "I teach a 7 hour day instead of the usual 6 hour day. It has been a tremendous blessing to the artists and to me. 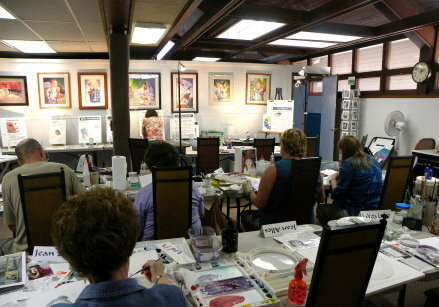 I teach three day or five day workshops. Artists come to pursue their dreams - and helping them move toward them is one of mine." Colorado . . . "We met yesterday for our weekly aftermoon paint day. I don't know if you know how you changed our lives. Everyone that took your workshop is different. We can't wait until next September when we hope you will return for a new workshop." Colorado Registrar . 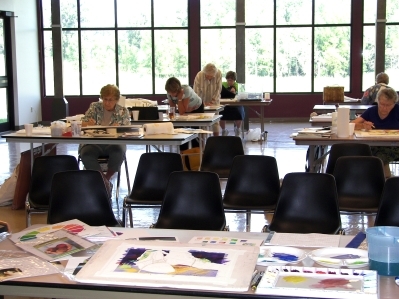 . . "It is with great enthusiasm that I recommend Dora Hagge as a watercolor workshop teacher. 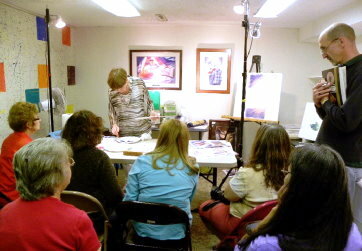 She has taught her brilliantly organized workshop series for eight years annually at the Showcase Art Center. The workshops are inspirational to beginners while at the same time give professionals a challenge to improve their own skill level. Dora combines demonstrations, lectures, and student painting time with valuable and sensitive critiques. Personally I have had the fortune of taking classes from many great painters: Schmidt, Shapiro, Couch, Lynch, Hill, to name a few. The Dora Hagge workshops are every bit as educational as these great workshop masters and will take your skills to a new level. She is an inspirational motivational speaker as well." 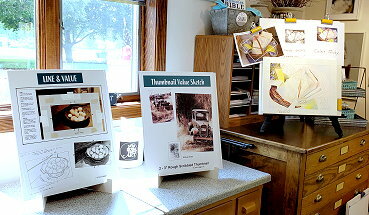 Author of "Watercolor For Dummies" and "Acrylic For Dummies"
Texas . 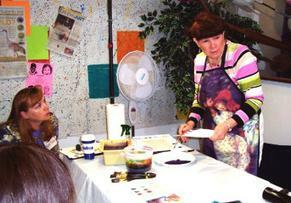 . . "We were delighted with the workshops. Seeing your paintings in person . . . why that was the icing on the cake! We were all so interested in how you could make your paintings have such glow, and while they were fascinating to see on your web page, seeing them in person was almost breathtaking! Texas . . . "I want to tell you how wonderful your Luminosity Class was today. You answered my searching for ways to put light in my paintings. You gave me the tools to work out a "light" issue I have been working on for over a year. In all my reading and workshops no one else has hit the right button to bring light and life into my still life painting. Thank you so much!" Texas . . . "Thanks for sharing your knowledge with us. I love my Dora brush." that I never imagined I could walk through. Your exuberance for painting design, color, and light is contagious. My desire, to achieve higher levels in these areas, has been ignited by your classes."